The ritual and religion of riding. Indulge me here. I’m going to take the risk of venturing off-topic for a moment. I’m going to get a little deep and flaky. Hang in there, I’ll come around to the point and how this ties to our first love: motorcycles. The class ring presentation ceremony at my daughter's high school, plus a wedding, got me thinking about the ritual of riding last weekend. Last weekend was a weekend for rituals. 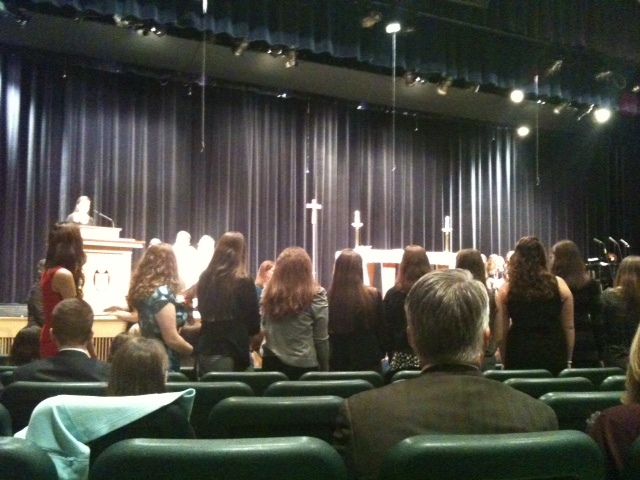 On Friday night I was at my daughter’s high school for their annual class ring presentation liturgy. She goes to a Catholic private girls school, and you can’t just get your class ring at such a school. The rings are presented within the context of Catholic mass. Mind you, this particular school ceased being truly Catholic many generations ago. Sure, it’s still owned by an order of nuns, there is the token nun who serves as principal, and there are crosses in the rooms and the occasional liturgy, but most, if not all, of the families sending their kids there are “cultural Catholics”. The once-meaningful rituals are now nothing but rituals. The mass itself. The blessing of the rings. The blessing of the students with holy water tossed in their general direction by an indifferent, frond-wielding priest. Various poems and songs and processions. Anyway, that’s a longabout way of saying I was thinking about rituals and their importance to people. Which led me to one of the things I absolutely love about riding a motorcycle: the rituals of riding. From that first warmish ride-worthy day in March when I de-winterize my bike, to the last weekend in November when I put it away for the season, the rituals of riding are repeated over and over and over again. And I cherish them. Each and every one. The pre-ride check ritual. T-CLOCS or POWER (petrol, oil, water, electrics, rubber) depending on which side of the pond you’re on. Going over the bike and making sure everything is in working order before shoving off for the day. Checking the tires, the levers and switches and lights, fluids. For me this is a labor of love because it is a thinly-veiled opportunity to ogle my bike from every angle and aspect. The gearing up ritual. Selecting the right riding gear for the day, the right helmet, the right glasses. Strapping on the chaps. Pulling on the helmet. Pulling on the gloves. Checking to make sure everything is tucked in, zippered up. Making sure I have a few extra layers of clothes in reserve in my saddlebags, a bottle of water, a pack of cigs and a light. Watching the other riders in the group for that perfect moment when with one silent knod from the leader everyone throws the leg over the ‘scoot, flips up the kickstand, fires up the engine, and revvs up the motor. Rituals of fellowship. With every group ride, there is a communal meal, usually at a diner favored by other bikers. During the fall, a friend took me to the Brass Ring Diner in Ringoes, NJ, which is a virtual mecca for motorcycle riders. Walk past Fran’s Pub in New Hope and the entire street outside is lined with motorbikes. Which provides another ancillary ritual that goes right along with the meal: checking out the other bikes. During the communal meal tales are shared of riding, gear, mods, next bikes, past bikes. The fueling-up ritual. Invariably at some point during the day one of the riders zooms to the front of the pack, points to his gas tank as he passes the leader, and we’re looking for the next available filling station. Once in the filling station we wait for our turn at the pump before pulling off and coming to a stop in front of the attached convenience store (there’s always a convenience store attached, isn’t there?) More stories, perhaps some coffee, another bite to eat, and a smoke or two. Then another round of gearing up and revving up and shoving off. Ritual celebratory cigar, somewhere on Skyline Drive. Rituals of travel. Each year I take one or two motorcycle camping vacations with a couple of riding friends. We have a spring trip and a fall trip with anywhere from three to five guys. My friend Al monitors the weather leading up to our departure day, and we meet on Sunday morning and travel off in whatever direction the weather is best. The rituals abound on this trip. We can’t pass through Virginia without stopping at Lexington Coffee Roasters or Front Royal Daily Grind, two of Ernie’s favorites. There are celebratory cigars smoked at the beautiful overlooks we pass by. 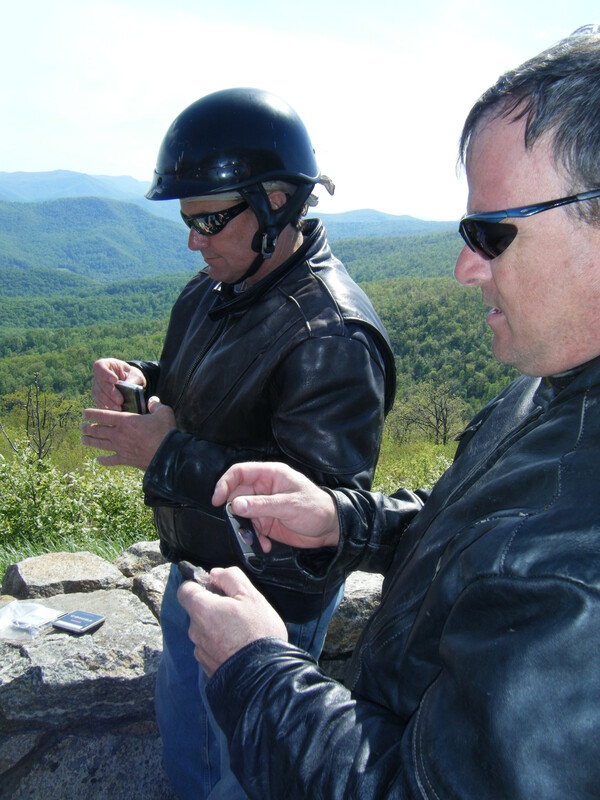 Studying maps for motorcycle roads, and arguing about which to take and where to go next. Piss breaks in the woods. Keeping our eye on the clock so we can pitch our tents in daylight instead of by motorcycle headlight. Checking weather reports to make sure we stay away from deep pockets of rain. Setting up camp is a ritual in and of itself. Cruising around the campground looking for the ideal open campsite. Breaking down the gear on our bikes and setting up our tents so that we are close enough to to each other that we don’t infringe on another campsite, but far enough away so you can’t hear the guy in the next tent over snoring or farting his way through the night. 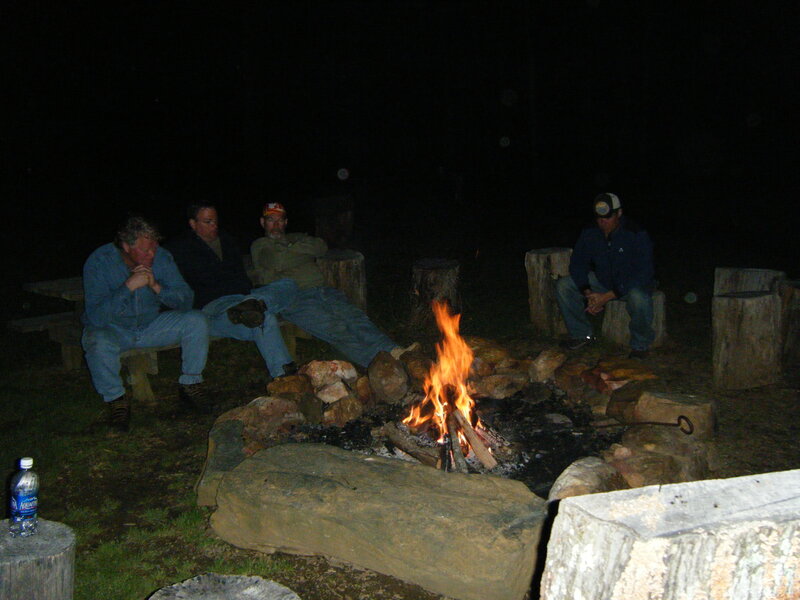 Building the campfire, and sharing stories around the campfire with more celebratory cigars (aren’t all cigars celebratory?) Breaking camp the next morning, bleary-eyed and cold, and packing the gear back onto the bike so it can all start again. The best and most enduring rituals embrace every one of the five senses: sight, hearing, taste, smell, touch. Having been born and raised Catholic the high mass is to me the archetype ritual, with its processions, gestures, changes in body posture (standing, sitting, kneeling), it’s eucharistic meal, incense, readings, bells, etc. Motorcycling not only embraces the five senses, it is an absolute feast for them. Which brings me to religion. For us motorcyclists, our obsession has all the earmarks of a good religion. Arcane knowledge that makes us among the chosen few, the elect. We have our Gods (Billy and Wyatt, Steve McQueen, Erik Buell, to name a few) our Holy Places ad pilgrimages (Sturgis, Daytona, the Tail of the Dragon); our sacred tomes (Motorcyclist, Cycle Word, Zen and the Art of Motorcycle Maintenance); we even tithe (for me my tithes largely go to Manayunk Triumph here in Philadelphia.) It’s how we spend our Sundays. And most importantly, it’s what lifts our souls and sends our spirits soaring. Great analogy and how true you are. No one could write this unless they had a profound love of riding. Keep the faith and Amen. Let the ride continue!